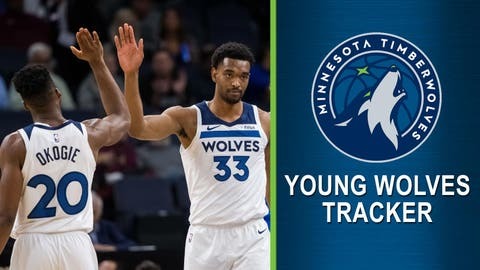 This is the 21st edition of the 2018-19 Young Wolves Tracker. The classes of 2016 and 2017 didn’t really work out for the Minnesota Timberwolves. Those drafts landed the Wolves Kris Dunn and Justin Patton, Tom Thibodeau’s hand-picked point guard and a raw 7-footer, respectively. Both were eventually wrapped up in the Jimmy Butler saga. Dunn landed in Chicago as part of the first Butler trade, and Patton ended up in Philadelphia as part of the second. If the early returns are any indication, the Wolves will look back on the 2018 draft a bit more fondly. Thibodeau landed a pair of promising talents in one of his last major moves as the Wolves’ president, taking Georgia Tech forward Josh Okogie with the 20th pick (acquired from Utah for Ricky Rubio) and Ohio State forward Keita Bates-Diop with the 48th. With four games to go in their rookie seasons, the duo have shown enough potential to get Wolves fans excited for the future. Okogie stepped in midseason after Robert Covington went down with an (ultimately season-ending) injury, and has been starting ever since. He’s averaging 27.1 minutes, 8.9 points, 1.3 assists and 1.3 steals in 41 starts since Covington went down. His latest outburst, a 21-point, 11-shot outing in the Wolves’ wild win over Golden State, isn’t exactly the norm at this point, but he continues to produce highlights on a pretty regular basis. Okogie delivered one of the season’s defining plays back in February, when he blocked James Harden‘s step-back 3 during a win over Houston. Bates-Diop hasn’t acclimated quite as quickly after spending a significant chunk of his rookie campaign with the G League’s Iowa Wolves, but has been getting regular minutes down the stretch. Once expected to go in the first round, Bates-Diop started 16 games in the G League before becoming a Wolves regular, averaging 17.7 points on 43.7% shooting, 8.8 rebounds, 2.1 assists, 1.6 blocks and 1.1 steals in 16 games. He made his NBA debut on Oct. 26, making sporadic appearances throughout 2018, before joining the Wolves’ rotation full time in February. He started three straight games for the Wolves with Andrew Wiggins ailing in early March, averaging 13 points on 42.9% shooting, 5.3 rebounds, 2.3 assists, one steal and one block. Bates-Diop had a career-high 18 points with six rebounds, two steals two blocks and an assist in just under 35 minutes during a win over the Knicks on March 10, still his best game to date. After back-to-back drafts failed to pan out for the Wolves, a pair of rotation-quality rookies seems like a solid consolation prize. — Tyus Jones has been solid since taking over as the Wolves’ starting point guard. He’s averaging 11.5 points on 46.8% shooting, 6.7 assists, 2.3 rebounds and one steal in 11 consecutive starts. He’s averaging 2.5 3-point attempts per game, shooting 42.9 percent. — Karl-Anthony Towns went 12-for-15 from the field in the Wolves’ win over Dallas, 80 percent. That’s just off his best performance of the season, 9-for-11 or 81.8 percent, back in November. — Andrew Wiggins had two steals against Dallas, and now has at least one block or steal in 16 consecutive games. — C.J. Williams and Jared Terrell, Minnesota’s two-way players, had 15 points each in the Iowa Wolves’ season finale, a 109-103 loss to Salt Lake City. — Cam Reynolds, who joined the Wolves back in February and recently signed with Minnesota for the rest of the season, has a made 3 in four straight games, the longest such streak of his career so far.